One of the things that sets Star Wars apart from all of the other space operas that have come and gone are its wonderful ships and vehicles. The iconic X-wing is easily as recognizable as Darth Vader is, so of course The Force Awakens is going to usher in a whole hanger full of new rides. Race into battle with these new vehicles, inspired by the world of STAR WARS: THE FORCE AWAKENS! Help the First Order keep the Resistance at bay with their SPEEDER BIKE and ASSAULT WALKER vehicles! Each STAR WARS: THE FORCE AWAKENS CLASS I VEHICLE includes an exclusive 3.75-inch action figure with five points of articulation. Each sold separately. Race into battle with these all-new vehicles, based on the world of STAR WARS: THE FORCE AWAKENS! Join the RESISTANCE with FINN’S DESERT SPEEDER and battle the FIRST ORDER SNOWSPEEDER as well as a new version of the fan-favorite SLAVE I from Star Wars: The Empire Strikes Back. 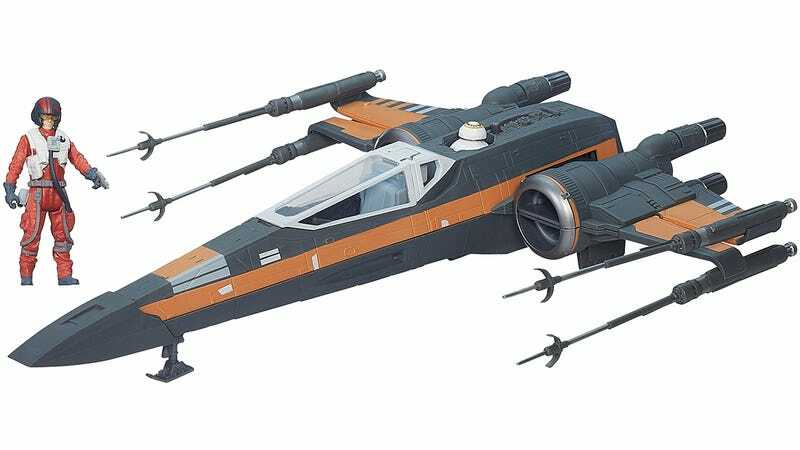 Each STAR WARS: THE FORCE AWAKENS CLASS II VEHICLE features a firing missile and includes an exclusive 3.75-inch action figure with five points of articulation. Each sold separately. Race into battle with these new vehicles, based on the world of STAR WARS: THE FORCE AWAKENS and inspired by STAR WARS REBELS! Imagine speeding across the desert world of Jakku with REY’S SPEEDER BIKE. Or, strike back against the EMPIRE with KANAN JARRUS’ Y-WING SCOUT BOMBER. Each CLASS I DELUXE VEHICLE features firing missiles or droppable bombs and includes an exclusive 3.75-inch action figure with five points of articulation. Each sold separately. Among the most dangerous starfighters in the FIRST ORDER’S fleet is the FIRST ORDER SPECIAL FORCES TIE FIGHTER! This specialized craft includes projectile missiles, detachable wings, a two-seat cockpit and an exclusive 3.75-inch special edition FIRST ORDER TIE FIGHTER PILOT figure. Additional figure(s) sold separately. The battle to restore order to the galaxy just got bigger! These large-scale vehicles are compatible with 12-inch Star Wars: The Force Awakens Hero Series figures (each sold separately). Vehicles include a SPEEDER BIKE with special edition POE DAMERON figure and FIRST ORDER ASSAULT WALKER with FIRST ORDER RIOT CONTROL STORMTROOPER SERGEANT. Each sold separately. The largest vehicle ever produced by Hasbro for STAR WARS: THE BLACK SERIES, this incredibly detailed Star Wars: The Force Awakens vehicle features movie-accurate wings and cockpit! The FIRST ORDER SPECIAL FORCES TIE FIGHTER is scaled to the 6-inch STAR WARS: THE BLACK SERIES figures and comes with an exclusive 6-inch FIRST ORDER TIE FIGHTER PILOT ELITE to steer the starfighter into battle. Cockpit can seat two 6-inch scale figures. Other figures sold separately. Take home your own fleet of STAR WARS: THE BLACK SERIES TITANIUM SERIES premium vehicles based on Star Wars: The Force Awakens, as well as the classic films. This multi-pack includes the MILLENNIUM FALCON, POE DAMERON’S X-WING, BIGGS DARKLIGHTER’S X-WING and TIE FIGHTER. Comes with four collector stands. Assemble your own fleet of STAR WARS: THE BLACK SERIES TITANIUM SERIES premium vehicles based on Star Wars: The Force Awakens, as well as the classic films. These collectible vehicles include the MILLENNIUM FALCON, KYLO REN’S COMMAND SHUTTLE, X-WING, DARTH VADER’S TIE ADVANCED, FIRST ORDER SPECIAL FORCES TIE FIGHTER, STAR DESTROYER FINALIZER, REY’S SPEEDER BIKE (JAKKU), LUKE’S LANDSPEEDER and more! Each pack includes one vehicle and one collector stand. Each sold separately.